The purpose of reading is to connect the ideas on the page to what you already know. If you don't know anything about a subject, then pouring words of text into your mind is like pouring water into your hand. You don't retain much. 7516324 This is hard to read and remember. 751-6324 This is easier because of chunking. 123-4567 This is easy to read because of prior knowledge and structure. Similarly, if you like sports, then reading the sports page is easy. You have a framework in your mind for reading, understanding and storing information. Reading comprehension requires motivation, mental frameworks for holding ideas, concentration and good study techniques. Here are some suggestions. Broaden your background knowledge by reading newspapers, magazines and books. Become interested in world events. Know the structure of paragraphs. Good writers construct paragraphs that have a beginning, middle and end. Often, the first sentence will give an overview that helps provide a framework for adding details. Also, look for transitional words, phrases or paragraphs that change the topic. Identify the type of reasoning. Does the author use cause and effect reasoning, hypothesis, model building, induction or deduction, systems thinking. Really smart readers try to anticipate the author and predict future ideas and questions. If you're right, this reinforces your understanding. If you're wrong, you make adjustments quicker. Look for the method of organization. Is the material organized chronologically, serially, logically, functionally, spatially or hierarchical? See section 10 for more examples on organization. Also Read: How to solve Data Interpretation part in Elitmus? Preview material, ask questions, discuss ideas with classmates. The stronger your interest, the greater your comprehension. Pay attention to supporting cues. Study pictures, graphs and headings. Read the first and last paragraph in a chapter, or the first sentence in each section. Just reading a book once is not enough. To develop a deeper understanding, you have to highlight, summarize and review important ideas. For most educated people, this is a lifetime project. The best way to improve your vocabulary is to use a dictionary regularly. You might carry around a pocket dictionary and use it to look up new words. Or, you can keep a list of words to look up at the end of the day. Concentrate on roots, prefixes and endings. Going through word-of-the-day of elitmusguru will definitely help you in this regard. Use a systematic reading technique like SQR3. Develop a systematic reading style, like the SQR3 method and make adjustments to it, depending on priorities and purpose. The SQR3 steps include Survey, Question, Read, Recite and Review. 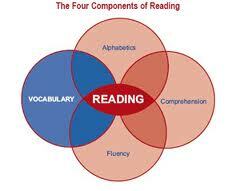 Good readers monitor their attention, concentration and effectiveness. They quickly recognize if they've missed an idea and backup to reread it.